The Gaza Strip is a narrow band of land wedged between Israel and a particularly beautiful segment of the Mediterranean Sea. The climate is always hot and dry, and in another century, it would make for a particularly breathtaking coastline where beach-goers could sit on the clean white sand and lose their thoughts in the sparkling blue-green waters. The problem with the Gaza Strip, however, is that in 1948, it filled up with Arab refugees from the war out of which emerged the state of Israel. Whether these families were fleeing Palestine (renamed Israel by the new rulers) out of fear or because the Israelis encouraged them to leave is a source of historical contention — and probably a combination of both. Whatever the answer, many refugees settled in this unremittingly hot strip of land, then under Egyptian rule, and the UN helped them build temporary mud "homes", while politicians squabbled over their future and cared little for their present plight. Over the years, the Gaza Strip swelled to 800,000 inhabitants and became a rabbit warren of squalid, flood-prone hovels, 20 family members sometimes crammed into two-room units in the refugee camps. The population of this sliver of land, 30 miles long and 5 miles wide, is the most dense in the world, second only to Hong Kong, and living conditions are appalling. The crude birth rate is one of the highest in the world (50 births per 1,000 inhabitants each year), while infant mortality is five times that of Israel (70 compared to 14 per 1,000) — a result of having only one doctor for every 2,200 people. Gaza does even worse on economic indicators, with no economic infrastructure to speak of, other than small businesses. The Gaza Strip was one of three land masses that Israel conquered in the 1967 war, and by far the worst off of all three. But in 26 years of occupation, Israel did virtually nothing to relieve the festering poverty and misery of its residents. Nor had the Egyptians invested in the welfare of Gaza when they were there before Israel. So it was not surprising when on December 8, 1987, events that changed the course of Middle Eastern history began in Gaza. An Israeli army tank-transporter was traveling inside the Gaza Strip when it suddenly made an unexpected turn and plowed into a truckload of Palestinians returning from work. Four Palestinians were killed and seven injured. Chances are that this was an accident, unintentional, but rumors spread that it had been deliberate. A further embellishment — not rooted in reality — was that the driver was related to an Israeli who had been stabbed to death two days earlier in the market of Gaza, and this was his revenge. The rumors ignited the festering rage. The funerals at the Jabaliyya refugee camp that evening became the occasion for a mass riot against the occupying soldiers, to which the Israeli army responded with tear gas and shooting, causing further Palestinian death and raising the level of rage one more notch. This began the cycle of action and reaction, violence and recrimination, that characterized the years of the intifada — stone-throwing at Israeli soldiers/tear gas; street riots/arbitrary arrests; Molotov cocktails/bullets; terrorist bombs/summary executions; and so on in a spiraling cycle of brutality. These incidents snowballed into a full-fledged uprising throughout the territories occupied by Israel since the 1967 war, which became known as the intifada ["uprising" in Arabic] — a mass rebellion to throw off the yoke of the Israeli occupation. What does "the Israeli occupation" refer to? Here's a capsule summary of the history of this region that should suffice. In the late 19th century, following ongoing persecution at the hands of many nations, some Jews living in Europe decided to renew Jewish settlement in this region — then called Palestine — and to establish a refuge for Jews fleeing anti-Semitism. This grew into a movement called Zionism, with the political goal of re-establishing a Jewish state in the historical homeland. At the time, Arabs were living in Palestine, and there was intermittent conflict between them and the Jews who sought to lay claim to the land. Some Jews, it should be noted, were willing to compromise with the Arabs over lands, while others believed that it was the manifest destiny of Jews to own all the land that had historically belonged to the Israelites during Biblical days. Thus began the twentieth century conflict that erupted into several full scale wars, of which I shall mention only two: The 1948 war resulted in the establishment of the independent state of Israel on a narrow slice of land. And the 1967 war (sometimes called the Six Day War) resulted in the occupation of additional lands that had previously been under the control of Arab states: the West Bank (formerly part of Jordan), the Golan Heights (formerly part of Syria), and Sinai and the Gaza Strip (formerly part of Egypt). Egypt settled its grievances with Israel in 1979 under the leadership of Anwar Sadat and Menahem Begin. In exchange for recognition of the state of Israel as a legitimate part of the Middle East, Israel returned to Egypt the entire Sinai peninsula. This was a significant sacrifice for Israel, as Sinai had the attractiveness of subterranean oil with few Arab inhabitants. But faced with international pressure, as well as the hope that peace with Egypt would lead to an accommodation with all the Arab states of the Middle East, Israel felt that the sacrifice was worth it. The occupation of the other territories was not so brief, and came with a heavy price — a population of two million Palestinians, most of whom were refugees and their offspring from the 1948 war for Israel's independence. Throughout this occupation, debate raged in Israel over whether or not to "keep" the territories. Some Israelis believed we should keep them, either for God-given reasons or as a security hedge, while others argued in favor of territorial compromise, at least enough to allow the Arabs in the region to make peace with Israel. The "compromisers" eventually fell silent, as no peace treaty seemed in the offing in exchange for returned land; while the non-compromisers, most of them religious, pressed ahead with a program of settlement on the land. From the June 1967 war until September 1993, when Israel began to divest itself of the occupied territories, twenty-six years of occupation passed, years filled with the brutality and harshness that are inevitable components of the subjugation of one nation by another. During the six years of intifada, the violence only worsened, the result of trying to quell the Palestinian uprising that ranged from pure forms of nonviolent resistance to vicious acts of terrorism. Neither side — Israeli or Palestinian — was innocent of ruthless tactics. During the years that Israel occupied the West Bank and the Gaza Strip, it imposed a harsh regime on the local population. First, it discouraged economic development in the territories, both out of a desire to exploit cheap Palestinian labor for itself and also fearful that development would foster Palestinian nationalism. Apprehensive of rising independence, Israel also imposed draconian constraints on daily life, disallowing the basic democratic freedoms — not only self-determination, but also representation, movement, assembly, expression, and many more. There was also the ongoing daily harassment and humiliation by individual soldiers. · differential law enforcement on Palestinians and Israeli settlers in the occupied territories. Most Israelis had learned to ignore what was happening in the territories through the first twenty years of occupation, but with the outbreak of rebellion there, terrible stories began to surface. Now, on top of the twenty years of oppression, new episodes were revealed of the brutality of Israeli soldiers in trying to quell the uprising. These were "our sons", 18 or 19 years old, clubbing people and opening fire into crowds. Some of these stories were true and others were exaggerations by the media, but the picture that emerged was of harsh oppression of the local populace. The reaction of the Israeli liberal public was enormous revulsion and guilt — that we had gone along with this occupation for so long, burying our heads in the sand to the fact that Israel had for a generation been an occupying force of almost two million people, and that this occupation was far more repressive than any of us had been willing to think about. For many of us, one of the worst moments at this early stage (many worst moments were to come later) occurred in the first month of the intifada when Yitzhak Rabin, then Defense Minister (later, ironically, to become the Prime Minister who died for peace), issued orders to the army to "break the bones" of the Palestinians. Although these brutal words were intended to replace the growing trend of soldiers to open fire on rioters, it was like telling someone that it would be better to beat a dog than to shoot it. The liberal left in Israel was horrified, but the soldiers followed orders, with several grotesque cases of vicious beatings by Israeli soldiers of Palestinians who had already been apprehended, not to mention gratuitous violence exercised by the sadists and otherwise frustrated troops. This was not what Rabin had intended, but it was a direct outcome of his policies. As the tally of death and injury rose, Israeli liberals became addicted to news about the riots and the attempts to quash them, and we began to cast about for ways to respond. At first we wrote letters to the editor, then composed, signed, and circulated petitions and published them. Hundreds of paid ads appeared in the newspapers during this period by Israelis calling upon the authorities to end the harsh retaliation. But the number of dead and injured rose from day to day. What to do? How to change things, how to stop the killing and violence? For many in the right wing in Israel, this meant how to get tough, how to clamp down on the Palestinians — the "iron fist policy" as the government and media called it. A few hawkish politicians on the right (Ariel Sharon, Rehavam Ze'evi, Raphael Eitan — all former generals) said the inevitable: "If I were in charge, the intifada would be crushed within two weeks." Many agreed with this view. The Israeli peace camp awoke with a start. Although some groups had been working to end the occupation throughout its twenty-year history, most of those collectively known as "the peace camp" had been dormant since its protests in the early 1980s had successfully forced the right wing Israeli government to leave most (though not all) of Lebanon. Now as the intifada swirled into a rage, the diverse components of the peace camp swung into action. A profusion of new peace groups rapidly evolved. Some were based on having a profession in common (Mental Health Workers for Peace, Clergy for Peace, Retired Generals for Peace, Social Workers for Peace); others on common interests (Concerned Parents, Women for Women Political Prisoners, Youth Against the Occupation, Committee of Artists Against the Occupation); and others sought to redress the human rights violated by Israeli authorities during the occupation (B'Tselem, Association for Civil Rights in Israel, Center for the Defense of the Individual, Physicians for Human Rights, Public Committee Against Torture). The largest and best organized peace group was Peace Now, which had been active since 1978 and could rely upon everyone in the peace camp to show up for its mass rallies. Appendix B lists the names of 74 peace and human rights organizations active during the intifada, and these don't even include the many peace-oriented research centers, newspapers and journals, theater and art groups, or the peace-teaching programs and welfare centers for victims. Most of these were founded or flourished at the onset of the intifada. It was a cornucopia of protest, with groups evolving, dissolving, regrouping, coalitioning, re-forming, splintering, and starting all over again. In the early days, one often met the same people in the same homes, now with a new slogan and a new strategy. ("We're only ten people in the peace camp," went the joke, "the rest is done with mirrors.") But no mirrors could account for the rapid proliferation of activists, nor for the formation of the women's peace movement that then came into being. Dai LaKibush, one of the outspoken organizations in the peace camp, was formed immediately after the outbreak of the intifada in December 1987. During this early period, Dai LaKibush was considered radical in Israel, as it called for negotiating with the PLO and establishing a Palestinian state beside the state of Israel. These positions were then considered extremist notions, although they were later espoused by the more mainstream Peace Now and ultimately even by most Israeli politicians on the left. Amidst the turbulence of the early intifada period, the Jerusalem branch of Dai LaKibush (men and women) had begun to hold a small weekly demonstration with signs calling for an end to the occupation. After several of these in which the public barely noticed their existence, the group met to figure out how to draw more attention to themselves. One of the men, a theater person, suggested that at the next demonstration, the men come dressed in white and the women in black, to heighten the dramatic impact. It sounded like a good idea and the women did don black, but somehow the men couldn't bring themselves to dress for the occasion, showing up in their usual garb. The women, though, looked dramatic — like a classical Greek chorus. To take advantage of the funereal effect, it was decided that the women would stand separately from the men. A little more interest was, indeed, generated among spectators, which encouraged the group to try again the next week, this time at the Jerusalem Cinematheque, only women wearing black garb. The next week, the first all-woman dressed in black demonstration was held. It was a very modest affair, only about eight women in attendance, and several men who moved among the bystanders handing out leaflets with more detailed political explanations. 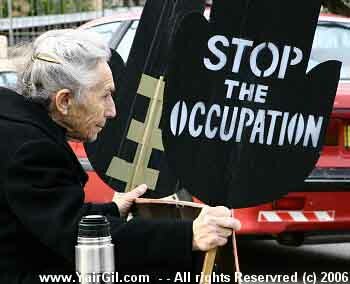 Ruth Cohen and Ida Bilu had made signs in the shape of hands, like traffic stop signals, on which they had printed "Dai LaKibush", the name of the organization, which, not coincidentally, also means "End the Occupation". The signs had white lettering on black cardboard, designed for visibility at evening demonstrations. Again the demonstration drew some interest, but the location still left a lot to be desired. 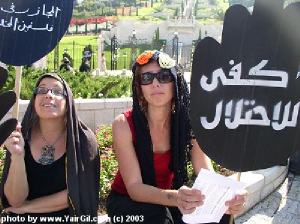 After it was over, Raya Rotem, the woman in the group who was most actively promoting the idea of having a women-dressed-in-black vigil — black, not just for dramatic effect, but as a sign of mourning for those killed and injured in the violence (Raya herself was a war widow) — made calls to all the politically radical women she knew, inviting them to a demonstration the following week. The following week, the women made the plunge from anonymity into mob recognition. On January 8, the women chose to demonstrate in the heart of downtown Jerusalem, on the bustling corner of Jaffa Road and Ben Yehuda Street. About fifteen women turned out, including my 15-year-old daughter Mieka Brand, who had heard about it from her friend Alva, Raya's daughter. And Raya wore not only black, but a big picture on which she had made a very provocative drawing — an Israeli soldier violently clubbing a Palestinian. It was not a picture geared to make friends, considering that most Israelis regarded our soldiers as victims of the violence, rather than its perpetrators. In consequence, the demonstration, to put it mildly, was noticed. "Awful and threatening," is how Ruth Cohen described it. The location exposed them to the brunt of public fury against women who chose to "mourn the enemy", rather than support our boys in uniform. "I came home covered with spit," recalls Hagar Roublev, one of the founding mothers. But they had found a formula that captured attention — women dressed in black — although they had chosen too vulnerable a site. The women called each other up and agreed to repeat the demonstration dressed in black, but to move it to Paris Square, where they would be somewhat more distanced from bystanders, though still well-exposed. The participants went through their phone books and called every woman they knew who might be interested in coming. Who were the Jerusalem women who began this all-woman vigil? This was a group of fifteen veteran peace activists - Dafna Amit, Mimi Ash, Judy Blanc, Ruth Cohen, Yvonne Deutsch, Ruth Elraz, Hava Halevi, Dafna Kaminer, Lily Moed, Tikva Honig Parnass, Maya Rosenfeld, Raya Rotem, Hagar Roublev, Hagit Segal, and Hagit Shlonsky. By the time these women showed up to the demonstration at Paris Square a week later, outsiders had also joined them, other women to whom the idea appealed. And the demonstration was declared a regular weekly vigil, and Paris Square, visible but raised above bystanders, was declared the permanent venue. Although the vigil was held weekly as a woman's action and developed its own momentum, the Dai LaKibush organization continued to regard it as one of its activities. It was not easy for them to relinquish parental control and ownership over their all-woman spinoff. At an organizing meeting held several months into the vigil, one of the leaders of Dai LaKibush announced that a number of decisions would have to be made about the Women in Black vigil. "You're relieved of all decisions about Women in Black," the founding mothers told him. "We don't belong to you anymore."
. For a good historical review, see Benny Morris, The Birth of the Palestinian Refugee Problem, 1947-1949, Cambridge: Cambridge University Press, 1987.
. Sara Roy, The Gaza Strip Survey, Jerusalem: The West Bank Data Base Project, 1986.
. Some claims are made by historians that the intifada in the occupied territories had begun months or even years earlier, but December 9, 1987 (the day after the initial incident) marks the date that the violence and civil disobedience began to escalate rapidly into a popular rebellion, and is thus widely regarded as the anniversary of the intifada.
. What the historical borders of this land should be are not at all clear. Even the Bible presents a variety of boundaries based on God's changing promises on various occasions.
. Sara Roy, "The Gaza Strip: A case of economic de-development", Journal of Palestine Studies, vol. 17, no. 1, pp. 56-88.
. For detailed information and documentation about the abuse of human rights in the territories during the occupation, see the many publications of B'Tselem: The Israeli Information Center for Human Rights in the Occupied Territories. A list of their publications can be obtained through the B'Tselem website www.btselem.org.il.
. In Israel, "left" refers generally to those who are willing to reach a political compromise with the Palestinians and the Arab countries. Only some of these also espouse economically left wing (socialist) views. Conversely, "right" refers to those unwilling to compromise.
. For a broad, insightful analysis of the Israeli peace movements prior to (and during) the intifada, see Reuven Kaminer, The Politics of Protest: The Israeli Peace Movement and the Palestinian Intifada, Brighton, U.K.: Sussex Academic Press, 1996.